Mass transit stations can be unruly places. 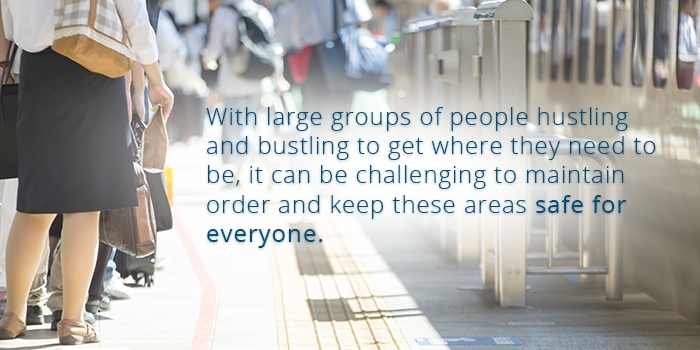 With large groups of people hustling and bustling to get where they need to be, it can be challenging to maintain order and keep these areas safe for everyone. Recently, Sacramento Regional Transit came up with a solution to help communicate critical information in these noisy areas. The group has installed overhead speakers they can use to communicate with commuters. Using Cisco IP phones and InformaCast, they conduct live audio paging to share information. This makes it easy for them to tell people to clear an area if there is a threat present. This has the added benefit of giving the commuters what they want—relevant information about events that might impact their travel. These speakers are used in conjunction with security cameras that monitor stations. Security personnel can see the situation and engage the people involved directly from the speakers. Incidents can range from littering and smoking, to more serious situations like suspicious packages in the area. You can learn more about Sacramento Regional Transit’s new speaker solution from the Sacramento Bee, here and here. In San Diego, the Metropolitan Transit System is using new technologies to help keep its more than 300,000 daily passengers on time. The group was looking for a solution that could provide accurate, real-time updates on train arrival times. They installed a Cisco-ruggedized device with GPS and LTE backlog capabilities. The device examines the motion of the vehicle, and by estimating the distance from the next stop, it can provide an accurate calculation of when it will arrive. Other improvements include an announcement system similar to Sacramento, real-time tracking of train locations and real-time diagnostics. This allows them to bring trains in for repair before potential damage could cause an accident. Both of these programs are part of Cisco’s Smart+Connected Communities. This initiative from Cisco looks for innovate ways to increase safety and refresh outdated systems in cities around the world. Using community data, sensors, new technologies and city assets, Cisco is transforming day-to-day city operations. The solutions that have been created cover everything from lighting, parking and traffic, to more sophisticated remedies for operation centers and digital network architecture. Singlewire Software is a proud partner in this strategy, integrating our InformaCast emergency notification software and leveraging it with other existing technologies communities are already using. This helps streamline processes and procedures, and provide an overall safer environment for the people city agencies are in charge of looking after everyday.